I am sick of puppy mills. I am sick of treating poor, sweet innocet puppies for parvo virus that could have been easily prevented with a vaccine. I am sick of seeing them not make it. I do not know who is buying dogs from these people. You are not "saving" these puppies. You are reinforcing the puppy mill to keep on producing puppies. Buying that puppies dooms many, many more to being born and raised in those conditions. Same goes for buying from a pet store. I know they are cute, but a good breeder would never let their puppies be sold in a pet store! If no one is buying their puppies, they will realize there is no money in it and stop breeding! Puppy mills do not care for their dogs. They are simply doing it for the money. And they are not willing to spend ANY money on their animal's health. They do not do vaccines, deworm and their animals never get health check. If a pregnant dog is having trouble in labour, they do no want to do the C-section she needs because it is too expensive, and the puppies die inside of her. Then she has to get the C-section anyways. Sometimes it is too late and she dies a few days later from an overwhelming infection. Then that "breeder" is angry with the veterinarians because they spent all this money and have nothing to show for it. These puppies do not even look healthy. They are sickly, they stink, they have crusty eyes, their coat looks horrible. They have worms. They are disgusting and they make me sad. This needs to stop. These poor animals depend on us to care for them. They cannot speak and save themselves. So if you are looking for a puppy, make sure you ask all the right questions. Go to the person's home. See where the puppy has been raised. Ask to see the parents. If it is questionable, report it! 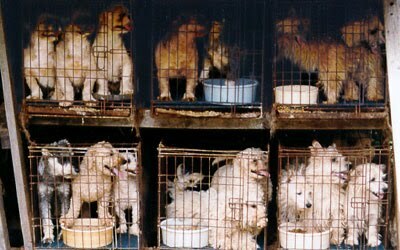 Most puppy mills will not let you come to their homes. Their contact info is always cell phones. They will meet you somewhere to drop off the puppy. They will sell to pet stores. Listen to me people! For the price you are paying at a pet store for a puppy mill MUTT, you can get a purebred dog, with papers, from an excellent breeder with a health guarantee! So watch out puppy mills. I am coming for you. And I am going to shut you down.